The distinctive relationships between landscape change, habitat fragmentation, and biodiversity conservation are highlighted in this original and useful guide to the theory and practice of ecological landscape design. Using original, ecologically based landscape design principles, the text underscores current thinking in landscape management and conservation. It offers a blend of theoretical and practical information that is illustrated with case studies drawn from across the globe. 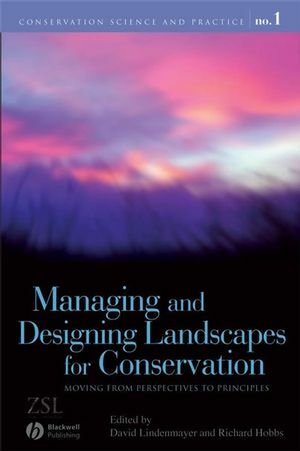 Key insights by some of the world’s leading experts in landscape ecology and conservation biology make Managing and Designing Landscapes for Conservation an essential volume for anyone involved in landscape management, natural resource planning, or biodiversity conservation. David Lindenmayer is a Research Professor in the Center for Resource & Environmental Studies at The Australian National University in Canberra. He runs six large-scale landscape studies in south-eastern Australia and has written 18 books and 260 scientific articles on conservation biology, landscape ecology, wildlife biology, forest ecology and management, and woodland conservation and management. Richard Hobbs is an Australian Professorial Fellow in the School of Environmental Science at Murdoch University in Perth, Australia. He has broad interests spanning restoration ecology, conservation biology, landscape ecology and vegetation management. He has published 17 books and 266 scientific articles in these areas of research and is a Fellow of the Australian Academy of Science. 1. Introduction. David B. Lindenmayer and Richard J. Hobbs. Section 1: Classification of Landscapes and Terminology. 2. The Whole Elephant: Classification and Terminology as Tools for Achieving Generality in Landscape Ecology. S. Mcintyre. 3.Enacting Landscape Design: from Specific Cases to General Principles. Yrjo Haila. 4. Landscape Models for Use in Studies of Landscape Change and Habitat Fragmentation. David B. Lindenmayer and J. Fischer. 5. Synthesis: Landscape Classification. David. B. Lindenmayer and Richard J. Hobbs. Section 2: Habitat, Habitat Loss, and Patch Sizes. 6. Remnant Geometry, Landscape Morphology, and Principles and Procedures for Landscape Design. Ralph Macnally. 7. Estimating Minimum Habitat for Population Persistence. Lenore Fahrig. 8. Habitat and Landscape Design: Concepts, Constraints, and Opportunities. James R. Miller. 9. Synthesis: Habitat, Habitat Loss, and Patch Sizes. David B. Lindenmayer and Richard J. Hobbs. Section 3: Structure, Degradation, and Condition. 10. Nature’s Infinite Variety: Conservation Choice and Management for Dynamic Ecological Systems. J.C.Z. Woinarski. 11. The Diverse Impacts of Grazing, Fire, and Weeds: How Ecological Theory Can Inform Conservation Management. Don A. Driscoll. 12. Forest Landscape Structure, Degradation, and Condition: Some Commentary and Fundamental Principles. Jerry F. Franklin and Mark E. Swanson. 13. Synthesis: Structure, Degradation, and Condition. David B. Lindenmayer and Richard J. Hobbs. 14. Incorporating Edges Effects into Landscape Design and Management. Thomas D. Sisk. 15. Edge Effects. David B. Lindenmayer and J. Fischer. 16. Edges: Where Landscape Elements Meet. Gary W. Luck. 17. Synthesis: Edge Effects. David B. Lindenmayer and Richard J. Hobbs. Section 5: Total Vegetation Cover, Pattern, Patch Content. 18. Emergent Properties of Land Mosaics: Implications for Land Management and Biodiversity Conservation. Andrew F. Bennett and James Q. Radford. 19. Assessing the Biodiversity Value of Stands and Patches in a Landscape Context. Philip Gibbons, S.V. Briggs, Andre Zerger, Danielle Ayers, Julian Seddon, and Stuart Doyle. 20. Avoiding Irreversible Change: Considerations for Vegetation Cover, Vegetation Structure, and Species Composition. Joern Fischer and David B. Lindenmayer. 21. Synthesis: Total Vegetation Cover, Pattern, and Patch Content. David. B. Lindenmayer and Richard J. Hobbs. Section 6: Connectivity, Corridors, Stepping Stones. 22. Corridors, Connectivity, and Biological Conservation. F.K.A. Schmiegelow. 23. Focal Species for Determining Connectivity Requirements in Conservation Planning. Reed F. Noss. 24. Connectivity, Corridors, and Stepping Stones. Denis A. Saunders. 25. Synthesis: Corridors, Connectivity, and Stepping Stones. David B. Lindenmayer and Richard J. Hobbs. Section 7: Individual Species Management - Threatened Taxa and Invasive Species. 26. Individual Species Management: Threatened Taxa and Invasive Species. Daniel Simberloff. 27. Managing Landscapes for Vulnerable, Invasive, and Disease Species. Erika Zavaleta and Jae Ryan Pasari. 28. Tools for Conserving Individual Plant Species in Dynamic Landscapes. Mark Burgman, Jane Elith, Emma Gorrod, and Bonnie Wintle. 29. Synthesis: Individual Species Management – Threatened Taxa and Invasive Species. David B. Lindenmayer and Richard J. Hobbs. Section 8: Ecosystems and Ecosystem Processes. 30. Ecosystems, Ecosystem Processes, and Global Change: Implications for Landscape Design. Adrian D. Manning. 31. The Costs of Losing and Restoring Ecosystem Services. H.A. Mooney. 32. Managing Disturbance Across Scales: An Essential Consideration for Landscape Management and Design. Viki A. Cramer. 33. Synthesis: Ecosystems and Ecosystem Processes. David B. Lindenmayer and Richard J. Hobbs. Section 9: Disturbance, Resilience, and Recovery. 34. Disturbance, Resilience, and Recovery: A Resilience Perspective On Landscape Dynamics. Brian Walker. 35. Core Principles for Using Natural Disturbance Regimes to Inform Landscape Management. Malcolm L. Hunter Jr.
36. Synthesis: Disturbance, Resilience, and Recover. David B. Lindenmayer and Richard J. Hobbs. Section 10: Aquatic Ecosystems and Integrity. 37. Principles for Conserving Wetlands in Managed Landscapes. Aram J.K. Calhoun. 38. Flowing Waters in the Landscape. P.S. Lake. 39. Water in the Landscape: the Coupling of Aquatic Ecosystems and their Catchments. Peter Cullen. 40. Synthesis: Aquatic Ecosystems and Integrity. David B. Lindenmayer and Richard J. Hobbs. Section 11: Bringing It All Together. 41. Does Conservation Need Landscape Ecology? A Perspective from Both Sides of the Divide. John A. Wiens. 42. What are We Conserving? Establishing Multiscale Conservation Goals and Objectives in the Face of Global Threats. J. Michael Scott and Timothy H. Tear. 43. Goals, Targets, and Priorities for Landscape-Scale Restoration. Richard J. Hobbs. 44. A Contribution to the Development of a Conceptual Framework for Landscape Management: A Landscape State and Transition Model. Peter Cale. 45. Principles of Landscape Design that Emerge from a Formal Problem-Solving Approach. Hugh P. Possingham and Emily Nicholson. 46. From Perspective to Principles: Where to from Here? Richard J. Hobbs and David B. Lindenmayer.